Last updated by Hannah Nolan at December 21, 2015 . It’s Christmas week and with all the festivities over the holiday season it is very tempting to overeat and let your exercise take a back seat, especially when you are spending time with family and friends and the atmosphere is so festive and celebratory. I want to think ahead to January which is just around the corner and do not want to be facing in to it with a massive gain over Christmas and undo all my hard work over the previous weeks. I want to finish the year strong and still be on target when the Christmas season has come to an end. I know I will be fine in my own house as I never buy boxes of biscuits or chocolates or fill the fridge with cheese selections and cream and stuff. It’s when I’m in someone else’s house to share meals or if I’m at a Christmas party, that’s where I can be wholesale dangerous and compelled to pet myself by whispering sweet nothings like “Sure live a little Mary! !” while busy shoring up whatever food is not nailed down. I really want to give myself a head start in the New Year so have a plan to make positive healthy choices with my food and exercise while still allowing myself to have a good time too. As it is for many people, spending time with family is a potential mine field when it comes to food. I’ve a tendency to be way more relaxed in my food choices when in holiday mode and spending quality time with those I love. There’s lots more opportunity for temptation and less of an inclination to follow through with any exercise. I’ve come up with a few strategies to help me get through the Christmas season with a more balanced approach and maintain my momentum and discipline with my healthy lifestyle campaign. Adopt a mindful approach to your eating – slow down when you are eating and take time to savour your food instead of wolfing it down and stop when you are full. Try to keep to the same normal portion sizes. Recognise when you are genuinely hungry and not just eating because the food is there. Another biggie is to choose not to go back for seconds! You are in control so allow yourself to choose wisely for you. My plan is also to eat only when I’m at the kitchen table for meals and snacks and not on the couch when I’m watching a movie or having the craic with my family. Don’t be tempted to stock up on tins of biscuits/chocolates – I used to buy the Selection Boxes and chocolates for presents a couple of weeks before Christmas and lo and behold I would have the lot snaffled myself by the time Christmas Eve would come! Usually we can buy way too much of it and then we receive gifts of chocolates and biscuits etc. and end up with loads of it in the house for the Christmas period and like troupers we are likely to polish off the lot ourselves. Sitting on the couch mindlessly munching out of a tin of Roses would clock up a colossal amount of calories in no time. A tin of 850g has a whopping 4080 calories and 192.1g of fat!!! Ensure to eat before going to your party/get together – I have a party and a few gatherings to attend over the holidays and know that on the day itself to ensure that I have a proper breakfast and lunch and not to be saving a load of calories for the party food at night time or else I will arrive ravenous and just shovel in what is on offer. I’m also planning to have a glass of water and a small healthy snack about 30 minutes before I attend so that I am not so over-hungry that I will overeat. Arriving to a party as hungry as a bear could leave your decision making abilities weak when faced with the tantalising aroma and sight of the gorgeous feast and liable to gorge. Whereas if you eat something small before you arrive it will take the edge off. Make a conscious effort to curb higher fat foods – It seems at Christmas time I am surrounded by pastries, croissants, donuts, trifles, cheesy dishes, creamy dishes and the list is endless! It is so tempting and I know I will need to have nerves of steel to resist my brother Jonathan’s scrumptious potato gratin so I will have to actively avoid it or else have a measured taste of it and then go outside and run up and down the hill for half an hour to burn it off! I need to make some substitutions for the pastries etc because if I even have one of them I’ll be a goner. My mother’s divine boozy trifle is irresistible so will ask that the last two spoonfuls be saved for me as if I have even a morsel of it at the beginning I will just go back at it with a soup ladle and dive in. So the plan is that when others are enjoying the higher calorie desserts I can dip in to my supply of chocolate rice bars and lots of my favourite fruits like raspberries, blueberries, papaya and pineapple to snack on. Choose to be active every day – I’ll be bringing my running gear with me when I am spending time with family and have factored in some exercise every day. My Mam has a gloriously large garden on a hill that I can run up and down on every day, surrounded by the most glorious scenery of mountains and forests. I will have no excuse as it will be on my doorstep and just because it’s Christmas will not be a good enough reason for me not to follow through on my fitness goals. I’ll also be only 20 minutes away from the ocean so I am really looking forward to getting to run on the beach too. It is tempting to lounge on the couch for the holidays and indulge in snoozing for half the days due to non-stop grazing all the time but it is so worth it to get up and even go for a walk and move your body. Involve other family members to go walking or running with you to make it more fun and the whole family can benefit. Keep a record of what you eat – I’m committed to writing everything down and recording it daily and honestly in my food diary, including any sneaky chocolates or sly spoons of cream etc. It all adds up and all those extra bites and tastes and handfuls can add up to several hundred extra calories that you hadn’t planned for. If you don’t keep a record you can easily lose track and have yourself convinced you haven’t eaten that much and if you do this over the whole Christmas holiday you will gain unwanted pounds. Keeping a record of what you eat daily means that if you go over you can make informed decisions about the following day, modifying your exercise and food goals if you need to. Stay hydrated – remember to keep drinking your water and aiming for the recommended eight glasses per day. Drinking water will help you feel fuller too and many times when we think we are feeling hungry we are in fact dehydrated and need to drink more water. Get enough sleep – remind yourself to get enough sleep. There may be nights when you are out socialising or nights when you are watching late night telly and catching up with house guests but try to get enough hours of sleep. Staying up late can lead to snacking because you are tired and not actually hungry. When your body doesn’t get enough sleep it over-produces the hunger hormone, ghrelin. In turn, the hormone leptin, which lets you know when you are full, lessens. When you are sleep deprived your metabolism slows down and you eat more when you are tired. I know I surely do! Plan a healthier Christmas dinner – Your Christmas dinner can be full of nutrition with your turkey, ham and vegetables. It’s all the extras that can rack up the calories. There are ways to minimise the calorie hike but still enjoying your meal all the same. First of all I will half fill my plate with vegetables, which thankfully is no chore for me as I love my veg, including the glorious brussels sprouts! Half filling the plate first with vegetables means less room for lashings of spuds and stuffing too. A medium portion of turkey and ham will be plated up, both of which will be trimmed of skin and visible fat. Removing the skin from the turkey meat saves you 70 calories and 6g of fat per 15g of crispy skin. I love my roast potatoes but also yummy mash so have decided to have just the one roast potato (cooked in Fry Light Spray Oil and not goose fat or oil) and also a small portion of mash. I’m bringing my weighing scales too so will weigh out my portions, just like at home, of turkey, ham, potatoes, stuffing and vegetables. My extravagant treat for the dinner will be allowing myself to indulge in my Mam’s gravy, it’s absolutely heavenly, but of course this will also be measured out with a tablespoon. I’m used to measuring out my portions sizes now and it’s no hassle as I know it guarantees honesty when I can enter what I’ve eaten to my food diary and it frees me up to make informed decisions about what I can eat during the day. This has been the cornerstone of my my ability to lose over 4 stone in 6 months. Enjoy a little indulgence – It is good and healthy to indulge once in a while once this doesn’t entail lashing into a kilo tin of chocolates over the holidays! Fit your treats and indulgences in and once you’ve enjoyed whatever it is, whether cake, trifle, a couple of chocolates, do remember to reign yourself in and not keep going at it every day. Whatever excuses you give yourself, over indulging every day over the Christmas with food is not going to do your healthy lifestyle any good and you will only end up having to work off those extra pounds come January. You can indulge but factor it in. YOU are in control. If you do however have a day where you are wholesale dangerous and go off the radar with munching too many treats, draw a line under it, don’t beat yourself up and try to pull it back a bit over the following days. Remember that the Christmas period is quite short in the grand scheme of things and you don’t want to lose focus on your goals and how you want to achieve them. It can be tempting to shelve healthy eating and exercise until the New Year and give yourself a free pass to dive in head first into a trough of food for the holidays. However this could mean up to an extra half stone or even more to be dealing with in January. You can still enjoy your Christmas and have a good time and yet not horse on the pounds by following a plan and not wrecking all your hard work so far. Shift your focus from the comfort of food to actively engaging with your family and friends, enjoying activities and good conversation together. 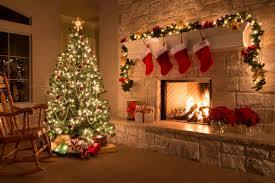 Wishing you all a very Merry Christmas, full of love, health, kindness and fun! 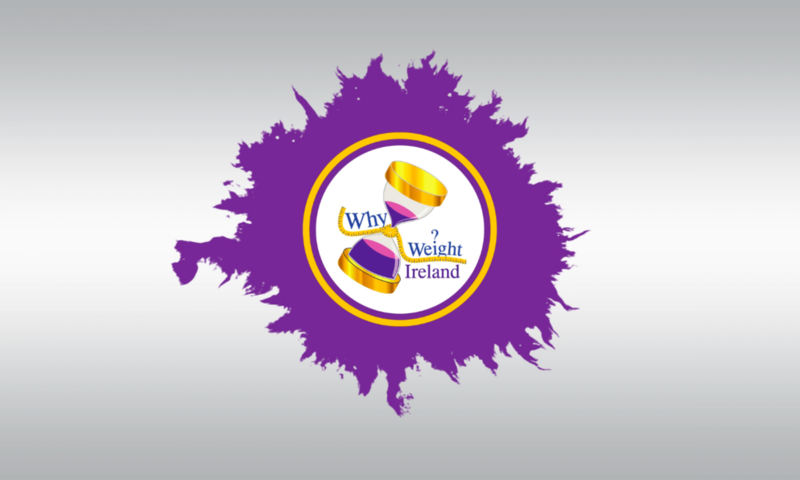 I’m delighted with my 1lb loss this week bringing my total loss to 61lbs, with only 72lbs left to go! It’s very gratifying this Christmas not to be feeling guilty or despondent over being massively overweight and instead to be feeling thrilled to bits with my achievements since May. I started off at my heaviest weight of 17 stone 10lbs and today I am a much lighter 13 stone 5lbs. I haven’t been this weight in over 8 years! I am full of anticipation for the new year ahead and to actively make progress towards new challenges and goals. To safeguard any chance of me diving head first into my Mam’s glorious trifle or any pavlova laden with cream on Christmas Day I came up with this delicious lower calorie alternative instead. I love it and my sister Emma has given it the thumbs up too 🙂 Altogether it is 304 calories but you could just make up one layer for half the calories. The mango coulis I picked up in Tesco and also the meringue nests. These nests come in the pink box and are slightly flatter than the usual thicker version. Enjoy! Place one meringue nest on a plate and top with one third of the half fat crème fraîche. Spread out with a spoon and drizzle over half tablespoon of the mango coulis. Top with some of the raspberries and blueberries. 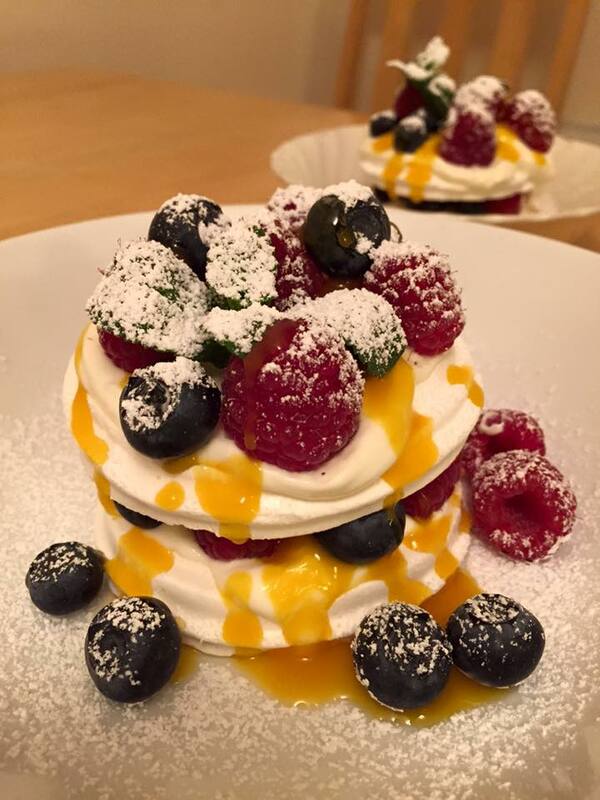 Place second meringue nest on top and layer with remainder of crème fraîche, mango coulis, and berries. Place sprig of mint on top and sift over the icing sugar. Add in any remaining berries to the bowl. Enjoy!